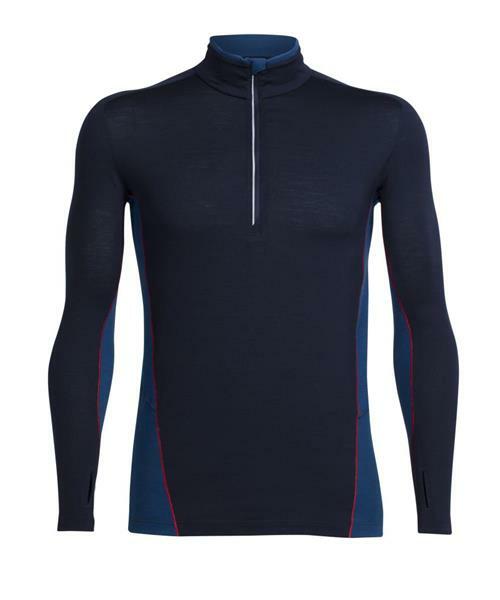 A stretchy technical top with strategically zoned fabrics for active comfort and temperature regulation, the Men’s Factor Long Sleeve Half Zip is a highly functional layer for moving fast in chilly conditions. The Factor features Icebreaker's 150gm corespun fabric, merino wool fibers wrapped around a nylon core, for added strength and durability which retains next-to-skin softness. For the underarm panels, they use 120gm eyelet merino mesh fabric to aid in ventilation during high-output days. Bonded seams eliminate chafing, while thumbhole cuffs add a touch of warmth and functionality, and make for easy layering. The deep front zip lets you quickly dump excess heat or manage your body temperature.